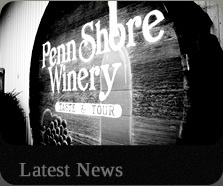 Penn Shore Vineyards obtained one of the first two limited winery licenses issued by the state of Pennsylvania in 1968 and began crushing grapes in September 1969. They first opened the doors to the winery in April of 1970. 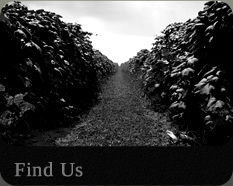 Penn Shore has many firsts to its credits including offering the very first Pennsylvania Champagne in 1970. 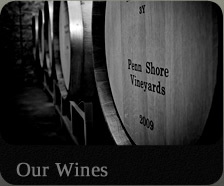 From the beginning Penn Shore has made it their mission to make good, reasonably priced wines that have consistent quality from year to year. A tour through the current cooperage area brings you face to face with tall, mammoth stainless steel storage tanks, a barrel room, champagne cellar, a modern bottling area, and large warehousing facilities. 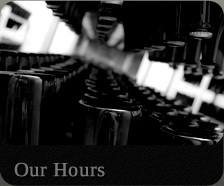 For purposes of enjoyment and pleasure there is a retail and museum area as well as a spacious tasting bar. In addition there is a lovely outdoor patio in the midst of vast vineyards open for your convenience. During the busy tourist season, Penn Shore personnel can expect at least 150 people a day, often closer to 250. There have been however, as many as 300-400 people touring the facility and tasting wines in a single day.